The brand RAYO was recognized as a Registered Trademark on September 26, 1922 as T.M. 159,315. The Collins Co. claimed the mark had been in use since February 1920. Another mark bearing the words RAYO DE COLLINS along with lightning bolts or thunder bolts was registered on February April 21, 1925. It was designated as Trade-Mark 163,887 and also claimed to have been used since February 1920. That mark was renewed on February 6, 1943. Both marks were primarily used on exported goods which led to the use of some labels with words in Spanish. Labels with only English were applied to goods exported to English speaking countries such as Australia as well as to goods distributed in the U.S.A. Most RAYO labels were designed specifically for axes destined for export. Collins axes have been known in America for approximately 175 years. Consideration should be given to the fact that the company was actually begun in 1824. At that time America was comprised of 24 states and three organized territories. The rest of what eventually became the lower 48 States was considered either the unorganized territories or in the case of the south=western states were actually part of Mexico. By 1852 there were 31 states and four organized territories with the remainder still considered the unorganized territories. By 1876 there were eight named organized territories, one unorganized territory (a combination of the Oklahoma Territory and Indian Territory) and 38 states. It wasn’t until 1912 that all the area now referred to as the Lower 48 was actually all divided into what are now recognized as states. As recently as 1999 The rest of what is generally considered North America, namely Canada, was still reorganizing its provinces and still had two territories. During almost all of that time Collins was making edge tools and it is understood that as early as approximately 1830 they were exporting significant amounts of those edge tools. Initially their export opportunities were Central and South America. That gives reason to understand why so many of the brands and labels are either in Spanish or Portuguese. Actually it would be more accurate to say Latin American Spanish and Brazilian Portuguese. In some cases, especially on signs that were displayed in Central and South America, there are words that appear to be a combination of those languages. It may be that due to the overlap and diversity of languages, along with the fact that the sign designers were unaccustomed to those languages, that irregular words were used. Whatever the case the fact remains that Collins, first as Collins & Co. and eventually as the Collins Company, were so active and influential in those areas. Their exportation to those areas apparently was by far more significant that their later competitors. Collins made a variety of items other than what are normally considered traditional edge tools. Those items included certain hammers and some wrenches. In addition they manufactured and offered a significant line of plows. Actually they offered plows quite early in their history and they developed a notable reputation for their line. The "plowshare" is an important component of a plow and it is actually an edge tool in the form of a sharpened steel wedge. The plowshare is the part that actually cuts loose the top layer of soil. Plows (also spelled ploughs) were an extremely important piece of equipment used in the preparation of the ground for planing. They ranged from simple to complex; from those pulled primarily by animals to those pushed for lighter, less demanding situations. Plows were used by farmers across the North American continent and were eventually displaced by mechanized equipment. Areas in less developed countries still rely plows pulled by animals or even human beings. Some are still being fashioned by local blacksmiths while others are manufactured in countries like China and India. Collins and Co. provided tens of thousands of plows during the 1800s and into the early 1900s. There were many designs offered and Collins supplied a number of variations depending on the type of soil and other plowing requirements. Collins & Co. also made the bulk of the other components used as component parts of their plows. They were sold under different brands and exported to a number of other countries. Collins plow label including warning in English and Spanish, ca 1900. The reason for the repetition of the word “cast” has not been determined. Trademark Registration No. 87,978 issued on August 20, 1912 to The Collins Co. for "Plows of All Kinds and the Parts Thereof." The Collins Company exported a significant amount of goods to Central and South America. In order to nurture that portion of their business, which was quite significant, Collins developed and registered a number of brands. Many of those brands were introduced in the late 1920s. Actually there were both registered and non-registered brands, some of which had accompanying labels. The brands represented names in the two major languages used in Central and South America. Those languages were Latin American Spanish and Brazilian Portuguese. Indications suggest that they may also have used Mexican Spanish for some brand names and for some advertising. In Latin American Spanish the brand name LUCHADOR translates to FIGHTER as the first choice but in European Spanish the first meaning varies from translator to translator. The meanings vary between WRESTLER., COMBATANT and FIGHTER. Using the spelling LUCTADOR the meaning translates from Brazilian Portuguese to English as FIGHTER. Brand markings used on some straight bladed cutlery like machetes. Some labels were designed specifically for axes destined for export. Used since January 1, 1928. The EL MARTILLO brand was registered on April 10, 1928 as No. 240,958 and again on December 30, 1930 as No.278,816. The earlier registration only included the EL MARTILLO name while the second registration also included a depiction of a forging hammer. The translation of the words EL MARTILLO from Spanish into English means THE HAMMER. 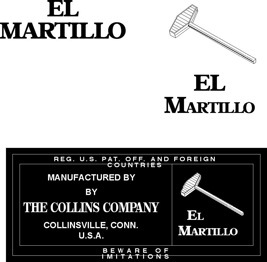 A comparison of the designs representing the EL MARTILLO marking and the LEGITIMUS markings with the crown, arm and hammer show a close similarity to the hammer in the EL MARTILLO trademark. The brand was specified in the earlier registration as being applicable for use on machetes and axes with no mention of other tools. The second registration expanded the applicability for use on axes, hatchets, machetes, picks, and mattocks, hoes, podaderas (shears) cavadores (hoes), shovels, bush hooks, cane knives, adzes, hammers, plows and plow parts. 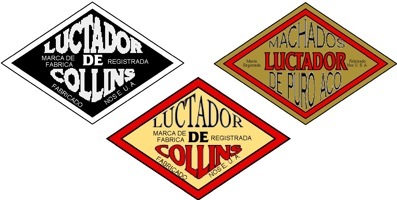 Whether the mark was used on all of the applicable tools is unknown but in part it shows that The Collins Company was attempting to protect the use of their brands in Spanish speaking countries. Registration No. 240, 958 Registration No. 278, 816. Facsimile of a paper label touting the El Martillo Brand. El Martillo means The Hammer. Example of banner as used on labels and in advertisements used in Spanish speaking countries. Not all brand names, logos and label designs were registered. There were many that were actually the property of a distributor while others were listed in label catalogs maintained by the various manufacturers. The Collins Company also used that system. In some cases labels were modified to appear as if the implements were actually made by the company name that appeared on the label. 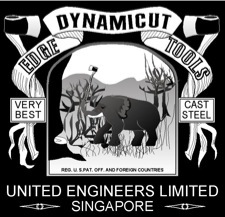 As axes and other edge tools were supplied to users just about all over the world it is difficult to say if all of the labels and brands used by a manufacturer are known. They probably are not but there are many that show up that were associated with one place or another. The RATTLESNAKE brand was most likely sold in the Southwestern part of North America and parts of Mexico. 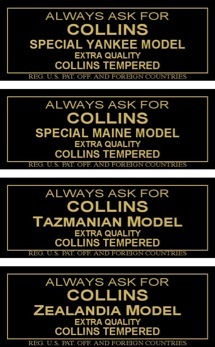 Labels used on Collins goods sold in South America. 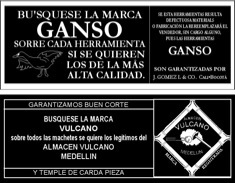 The brands are Goose and Volcano. 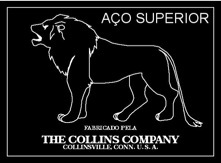 Label used on Collins axes probably sold in Mexico. The design was registered as Trademark No. 197,702 on April 21, 1925. It was claimed to have been used since September of 1924. 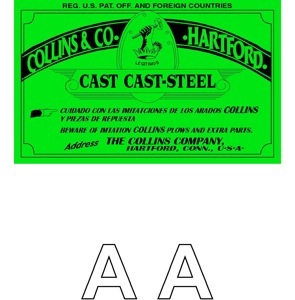 The Collins Co. had factories in four different countries. The major factory was in Collinsville, Connecticut in the United States. They are had factories in Brazil, Columbia and Mexico. In 1966 the facilities in Collinsville were sold to the Mann Edge Tool Co. of Lewistown, Pa. The other three factories were sold to the Stanley Tool Company. Labels used on axes exported to Australia and New New Zealand. Zealandia is another name for the Submerged continent of New Zealand or Tazmantis. Labels used on axe exported to the Pacific Rim. The EBONITE brand was intended to be used on a variety of forged goods, including axes, that had a dead black finish. Primary Trademark Registration No.36,894 on August 13, 1901 and No.89,629 on December 31, 1912. Exported and used by Western Auto Stores. Trademark Registrations No. 4,210 and No.4,211 issued on December 19, 1876 to The Collins Co. Trademark Registrations No.9,551 issued on JULY18,1882 to The Collins Co. Some labels reportedly included the image of an Emu bird. Primary Trademark Registration 25,910 on January 22, 1895 to The Collins Co. Also as No. 87,980 on December 31, 1912. The brands listed above are believed to have been primarily for the Australian trade.